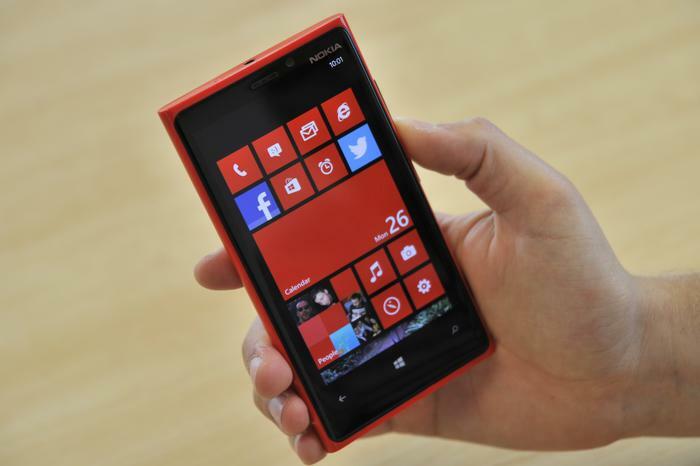 Can Nokia give Microsoft's Windows Phone platform the boost it needs? The Nokia Lumia 920 is a superbly constructed smartphone that has an outstanding camera and an excellent screen. However, there's no mistaking the sheer size of this phone and the limited Windows Phone third-party app ecosystem can't match rival platforms. Nokia's Lumia 920 could represent a last throw of the dice for the once dominant Finnish company, who is attempting to provide a valid alternative to Apple's iPhone and Google's Android devices at the top-end of the smartphone market. The Lumia 920 is superbly constructed, has the best camera on the market and comes with a excellent display. However, there's no mistaking the sheer size of this phone and the Windows Phone third-party app ecosystem can't match rival platforms. The first thing you'll immediately notice about the Lumia 920 is its size — there's no getting around the fact that this is a huge phone. The Lumia 920 is thicker (10.7mm) and heavier (182g) than most other smartphones on the market. While we can appreciate the amount of tech that's packed into that shell, particularly the camera and its floating lens optical image stabilisation system, users who long for a thin and light phone are best advised to look elsewhere. The weight and girth of the Lumia 920 is very noticeable, even if you're coming from an already large device like the Samsung Galaxy S III. Users who long for a thin and light phone are best advised to look elsewhere. There's an upside to everything though and in the case of the Lumia 920 that comes in the form of superb build quality. We've always been fond of the construction of Nokia handsets and the Lumia 920 is certainly no different. We love how the device curves into your hands when it's picked up and you can immediately tell that a lot of thought has gone into the ergonomics. The single polycarbonate block curves nicely in your hand and the buttons on the right side are all well positioned for one handed use, though the glossy finish is very slippery. One downside to the Lumia 920's design is the lack of expandable memory, though the phone comes with a reasonable 32GB of storage. With 29.12GB available to store apps and files on, this should be enough for most users. The first thing you'll immediately notice about the Lumia 920 is its size. There are some small but appreciated design touches on the Lumia 920. The power, volume and home buttons are made from ceramic, which Nokia says will prevent scratches. It's only a small touch but one we suspect will be appreciated by plenty of users. 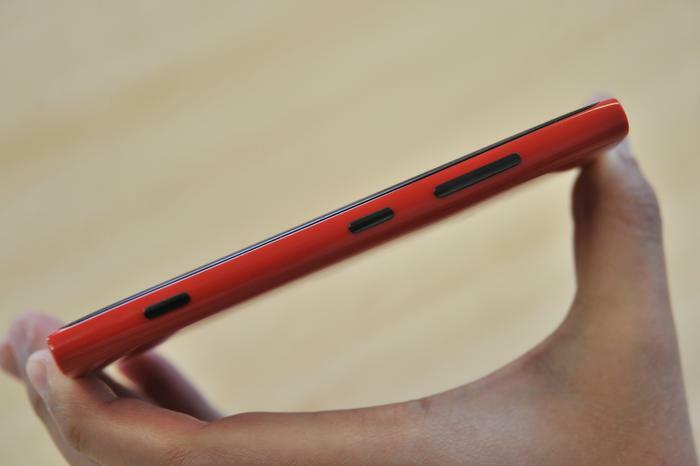 We also love the centre-positioned headphone jack on the top and the visible torx screws on the bottom. This kind of attention to detail often goes overlooked on many other smartphones. 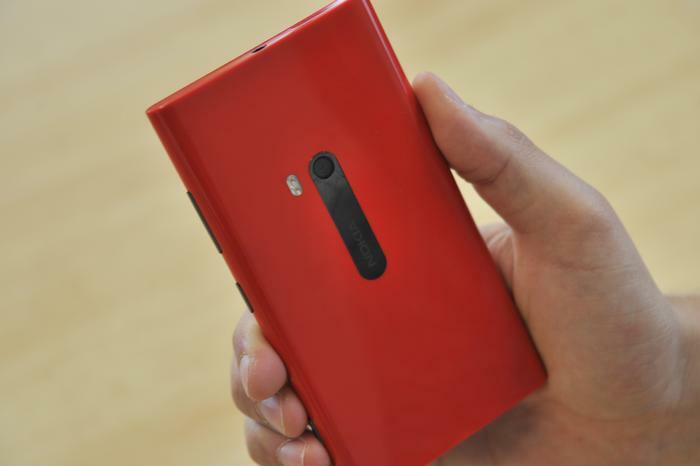 We love the overall look of the Lumia 920. Unlike most other smartphones on the market, the design is fresh and inviting. The bright colours on offer may not suit all tastes, but we quickly grew fond of both our red review unit and the bright yellow model we handled in a pre-release demonstration. For those who prefer more traditional colours, the Lumia 920 is available in black and white models, too. The black model has a more traditional matte finish. The buttons on the right side of the Lumia 920 are well positioned for one handed use. It's one of the best smartphone screens on the market. 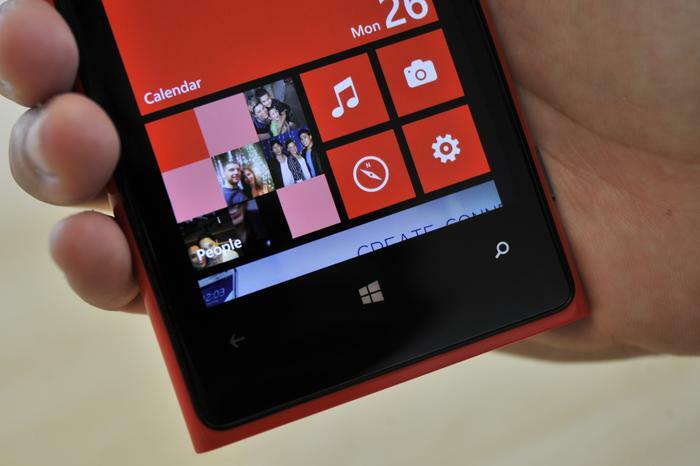 The Nokia Lumia 920 comes with a 4.5in IPS screen with a resolution of 1280x768, resulting in a pixel density of 332ppi. It's one of the best smartphone screens on the market. Colours are vibrant and eye catching and viewing angles are excellent, though black levels aren't as deep as most AMOLED screens. We found text, especially in the Internet Explorer browser, to be super crisp and clear with no visible aberrations. Nokia says the screen uses "PureMotion HD+" technology, which aims to offer blur free scrolling. We've never considered this an issue on most other phones, but it works as advertised here, with smooth and slick transitions between screens on the Windows Phone 8 OS. We also found the Lumia 920 works extremely well outdoors in direct sunlight and can confirm that the screen does respond to your touch even if you're wearing gloves. 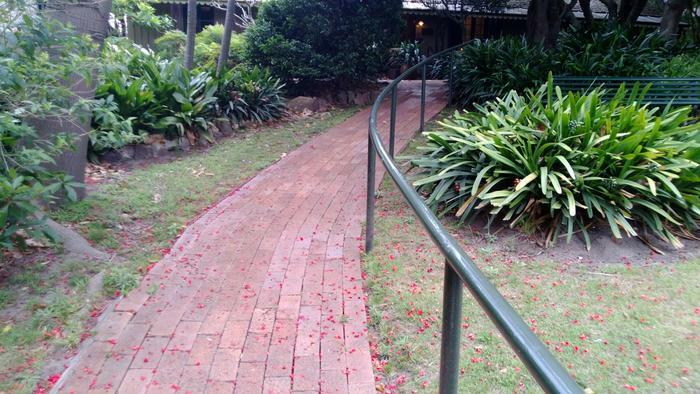 This is a handy feature for those in cool climates, but it's not as relevant in Australia. The Lumia 920's screen displays vibrant colours and has excellent viewing angles. The Nokia Lumia 920 is a fast and slick smartphone. The Nokia Lumia 920 is one of the first devices to run the latest version of Microsoft's Windows Phone platform, Windows Phone 8. The first thing you'll notice is speed: the Lumia 920 is a fast and slick smartphone. We didn't experience any lag whatsoever when flipping between apps, scrolling through long lists or opening apps like the camera. Basic day-to-day tasks on the Lumia 920 are smooth and responsive. Scrolling, especially in the Internet Explorer browser, is smoother and faster than most Android phones we've used. All in all the combination of the Windows Phone 8 OS and the Lumia 920's hardware makes for a speedy and efficient device. The biggest new addition to Windows Phone 8 itself is a new home screen interface with support for small, medium and large live tiles. There's also more colour customisation options, built-in Skype integration, a revamped backup system that now includes the ability to backup SMS messages, a 'Kid's Corner' function where only pre-selected apps can be accessed and the expansion of the People Hub with a new 'Rooms' feature that shares lists, calendars and photos. 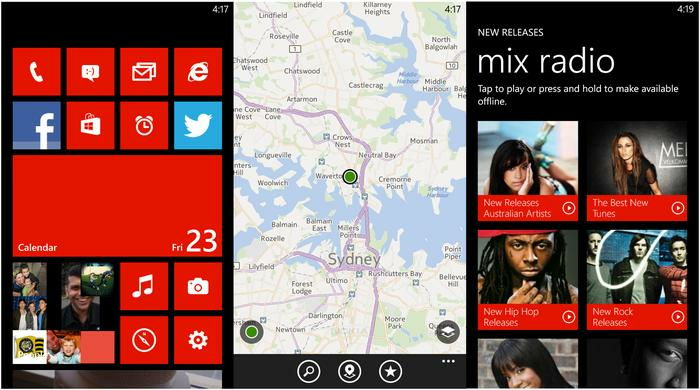 The Windows Phone 8 home screen, Nokia Maps and Nokia Music apps. The Windows Phone 8 ecosystem has some excellent core features. All users receive 7GB of SkyDrive Storage for free. The built-in, free Microsoft Office app handles Word and Excel documents with ease and is without a doubt the best office client on any mobile platform we've seen. The Xbox Music service, too, is decent value at $11.99 per month or $119.90 per year for unlimited music streaming. We did find it odd, though, that the Windows Phone 8 platform can't open a basic .wav file, such as the voicemail message service used in many workplaces. In addition to Windows Phone 8's core features, Nokia provides some excellent pre-loaded apps which you won't find on any other Windows Phones. Nokia Maps and Nokia Drive are the most notable and convenient. The Maps application is significantly more comprehensive than Apple Maps on the iPhone 5 and even betters Google Maps on Android phones in some ways. It allows you to download a range of maps from entire countries to use when you don't have any mobile network coverage. In addition, Nokia Drive provides free turn-by-turn navigation in a clean and easy to navigate layout. The ability to download maps means the navigation service doesn't use any mobile data, just the phone's built-in GPS chip. 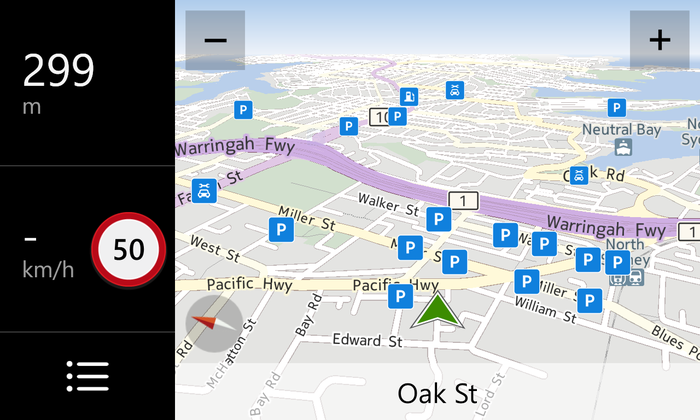 Nokia Drive offers free turn-by-turn navigation with the ability to download maps. 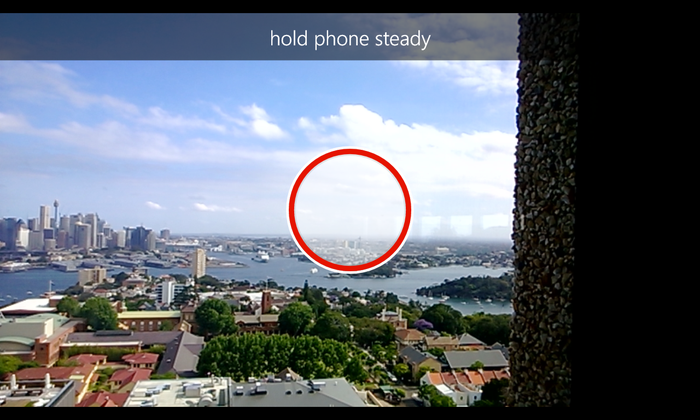 Nokia also includes the City Lens app, which uses augmented-reality to display nearby points of interest. However, we found it largely a gimmick and the same results show up in a standard search through the Nokia Maps app. There's also four photography app add-ons, which we'll get to in the camera section below. Despite Nokia's excellent bundled apps, one of the biggest issues with the Nokia Lumia 920 and more importantly the Windows Phone OS itself, is the lack of popular third-party apps. A visit to the Microsoft App Store will quickly tell you all you need to know but many apps we use on a daily basis on iOS and Android simply aren't available on Windows Phone. The lack of quality third-party apps on the Windows Phone platform is an issue. It's not simply about the number of apps here, but the number of important apps that have become popular on smartphones. A few examples include Dropbox, Pocket, Instagram, Spotify, Pinterest, Pulse News and Flipboard. These apps and many more may eventually come to the platform, but they're not available right now. Further, many of the non-official Dropbox apps we used were awful and attempted to masquerade as an official app, while the price of apps on the Windows Phone platform often seem higher than competing platforms. The lack of quality third-party apps is an issue that we suspect will prevent most average consumers switching from iOS or Android to a Windows Phone like the Lumia 920. In addition, the Windows Phone services available on the Lumia 920, such as Xbox Music, strongly appeal to those who are already ingrained in the Microsoft ecosystem. If you've got an Xbox, use a Windows 8 PC and have a Windows Phone 8 device, these services are a great option. For everyone else, like those who might use a Mac, an iPad or an Android tablet, the incentive to use these services is significantly diminished. A good example is already established services like Spotify that this author uses daily. This isn't available (yet) on the Windows Phone platform yet it's readily usable on an iPhone or an Android device. To switch to the Windows Phone platform and the Lumia 920 requires a compromise that many everyday consumers may not appreciate. Much fuss has been made about the heavily marketed camera on the Lumia 920. While there has been a lot of hype, most of it is deserved — the Lumia 920 is without a doubt the best camera phone on the market. The Lumia 920's camera is able to capture more detail than most other camera phones. The camera uses what Nokia calls floating lens technology and combines that with an f2.0 aperture and a backside illuminated sensor. Nokia says the lens sits on tiny springs which minimises movement when you're capturing images and video. The results are best seen in low-light, where the Lumia 920 is able to capture more detail than most other camera phones we've reviewed. Minimal image noise, excellent colour reproduction and accurate detail are highlights, though the overall colour tone can often appear more neutral than most other smartphone cameras. Video recording is also excellent, and the optical image stabilisation works a treat here, too. A photo we captured with the Lumia 920 (click to enlarge). We did note that you really have to keep your hand steady when capturing images with the Lumia 920, despite the use of optical image stabilisation. For best results, we recommend using the on-screen capture button rather than the physical shutter key on the right side of the device. The camera app itself is fast and is aided by plenty of settings to tinker with. Nokia's multiple camera modes, which it calls lenses, are impressive. There's a panorama lens to capture panorama shots, a cinemagraph mode that captures movement and turns still shots into a GIF file and a SmartShot lens that captures multiple photos and then allows you to remove elements from an image, like someone walking in the background of your photo. These are all valuable additions, but they open in a seperate app to the camera despite being present in the options menu, which is annoying. There's also no way to immediately share a Cinemagraph image, from the app, which seems like an oversight. The Nokia Lumia 920 is a 4G phone that's exclusively sold by Telstra in Australia. It offers reasonable battery life compared to other 4G phones we've tested, but we still couldn't push through a full day of use. We experienced around 13 hours of battery life per day on average but if you're a moderate user then you should be able to get through a full day. One nice touch is the fact that the Lumia 920 has wireless charging built-in, though you'll have to purchase some optional accessories to make full use of it. There's a wireless charging pillow by Fatboy, a Nokia-branded wireless charging plate and a JBL speaker that will charge the phone and enable one-touch Bluetooth pairing using NFC. Because these accessories all work on the Qi wireless charging standard, they will be compatible with future models and should even work with non-Nokia smartphones that feature Qi wireless charging capabilities. The Nokia Lumia 920 is available through Telstra in Australia.